A number of sites were excavated by John Moss-Eccardt during the period 1958-74 as the industrial estate at Blackhorse Road in Letchworth Garden City was under construction. The project eventually investigated an area approaching 132,000 m2. Within this area, fourteen zones were looked at in detail. Zone V contained a D-shaped palisaded enclosure, its long side some 58 m long. Finds from the enclosure spanned the Late Neolithic to the early Iron Age. 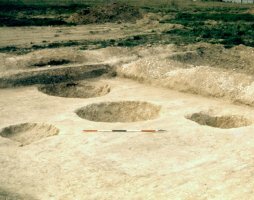 Zone VI also contained evidence of Late Neolithic activity in the form of a series of pits. These funnel-shaped features produced a variety of Late Neolithic pottery sherds and worked flints. In general, the evidence suggests that this site formed part of an extensive Late Neolithic zone of activity. Within the other zones, a range of Late Neolithic features (including numerous pits) were excavated, as well as a possible Middle Iron Age roundhouse within a series of enclosures, several Mid-Late Iron Age pits, three of which contained evidence of human remains, a further D-shaped enclosure of probable Late Iron Age date, and series of Late Iron Age/Early Romano-British intercutting ditches. An important La Tène II/III iron cauldron collar and rim was found in one of the ditches. Eight human burials were also found. Two of were of Iron Age date; the others, however, date from the early Saxon period (AD c 600-700), perhaps forming a small Pagan Saxon cemetery. Sections were also cut across the line of the Icknield Way, which still existed as a visible hollow-way along the south of Moss-Eccardt’s excavations. The showed that the Late pre-Roman Iron Age and Romano-British occupation areas had been bordered by a “defensive bank and ditch”. The hollow-way traversed the southern edge of the excavations in a north-east/south-west direction. Since the time of these earlier excavations all visible traces of the Icknield Way have been lost, primarily under the construction of a range of industrial units. A large 19th century quarry is known to have existed near the junction of the railway line and Green Lane. Originally excavated to supply chalk for the Royston and Hitchin Railway Company, the quarry remained open into the late 1960s, when extensive landscaping took place.